Hey all! Time to finally start catching up and bring you all some great Transformers figures. Today we start taking a look at the newest of the TFC combiners, Uranos... or Not Superion. TFC was responsible for and delivered to us the awesome Hercules; their rendition of Devastator. Hercules was an impressive showing of what was possible for modern Transformers when dedicated thought and engineering was applied... along with a willingness to drop a large amount of extra cash. You can still read One Per Case's review of Hercules HERE. In Uranos, TFC has been able to deliver yet another great figure set. Take a look at piece number one, F-4 Phantom, after the jump! F-4 Phantom is the TFC Uranos homage to the G1 Aerialbot, Fireflight. Way back when... Megatron became tired of the Autobots ruling the roads, so he created his own special team of Decepticon cars, the Stunticons. Looking to even the playing field, Optimus Prime had the Aerialbots constructed; the "first" flying Autobots. The Aerialbots and Stunticons fought time and time again... whether as individual bots, or in their combined forms of Menasor and Superion. Fireflight's place on the Aerialbots is that of Reconnaissance. The only problem is, he'd rather be laying back and relaxing versus scouting ahead for Decepticons. Fireflight is prone to daydreaming in mid-flight which can lead to unforeseen accidents. 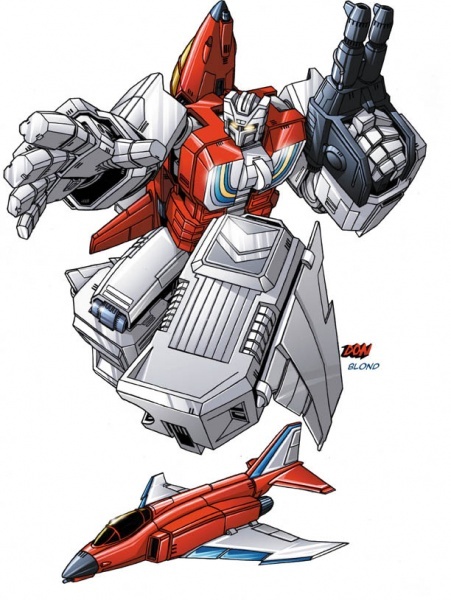 When called upon, Fireflight combines with the other Aerialbots by forming Superion's right arm. TFC delivers to us an excellent homage to Fireflight, named F-4 Phantom. Phantom's box is a window box adorned with some beautiful art and shots of the figure in all of it's modes. Open the box and find Phantom tied into a plastic tray which is in turn set in a card tray with modified version of the box art on it. Underneath the the tray you'll find full-color instructions that double as a poster along with a Tech-Spec card. TFC delivers another great figure. Packaged in Bot-mode, Phantom feels sturdy and solid. He has plenty of articulation allowing for a myriad of poses. Molded primarily in white, red, and black plastic, Phantom is an amazingly accurate homage to his G1 counterpart. There are scarce paint-apps throughout; the wings have some striping on them and there are a few alpha-numeric tampographs on the Alt-mode fuselage. All of the apps are VERY cleanly applied. Out of the box, the Bot-mode is slightly mis-transformed; the nose and tail sections are not connected as they should be leaving a rather large gap between them. While tight, the tail will eventually lower down. Once connected, everything stays in place well. Included with Phantom are a few extra parts. Uranos' right hand; which is articulated fairly well throughout. Each finger is hinged at it's base with a mid-finger knuckle. The thumb also has a mid-joint as well as having a ball-joint at it's base. The hand itself is mounted into a swivel 'base' that will allow wrist rotation once Phantom is set up in combined mode. The second accessory are two 'missiles' to mount in various spots on Phantom's Alt-mode, under the wings, and Bot-mode, on the forearms or in Phantom's hands. Surprisingly, despite the upgrade from Scramble City style G1 combiner to TFC work of art, Phantom's transformation is fairly similar to his G1 counterpart. The arms unfold and then lower close in to his sides while the legs snap together and push up into the body. The nose cone and tail-fin sections come apart and fold forward and aft just like the G1 figure. THere is a small piece that helps bridge the gap left between the two halves. The wings fold out and the 'missiles' connect under the wings. Transforming Phantom into his combined mode is akin to getting him into and unfinished Bot-mode. Bring the Nose and Tail section in, fold in the wings. Rotate the shoulder connection point out at the chest and rotate the Bot-mode head to hide the face. Connect the hand in-between the lower 'legs' and use the Bot-mode waist as the elbow. Overall, TFC makes a solid product; it has a weight and heft that makes for a good feel. Unlike Hercules, I do feel that the combined mode is a little limited in the elbow articulation thanks to same said bulk, but the overall look is good. I only hope that it doesn't hinder the end result combiner in any way. Stay tuned as I take a look at the second figure in the TFC Uranos set, the main body of Uranos, the SR-71 Blackbird... or Not Silverbolt. Pics, words, and early bird check-in by Scion of Primus.